This delicious, big cookie is so easy to make in a cast iron skillet! Lightly grease your cast iron skillet with vegetable oil. In your large mixing bowl combine your brown sugar and softened butter and beat well with a hand mixer. Once mixed, add your egg and vanilla and mix. Add your flour, baking powder, and salt. Mix again. Fold in your Easter M&M’s. Press your cookie dough into the bottom of your cast-iron skillet. Feel free to press more M&Ms into the dough at this point, if you like! Bake for 25 minutes or until center is set. Be very careful when removing the pan from the oven as it is very hot! 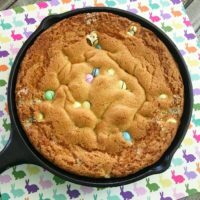 Let cool a bit, then enjoy your cast iron skillet Easter cookie!